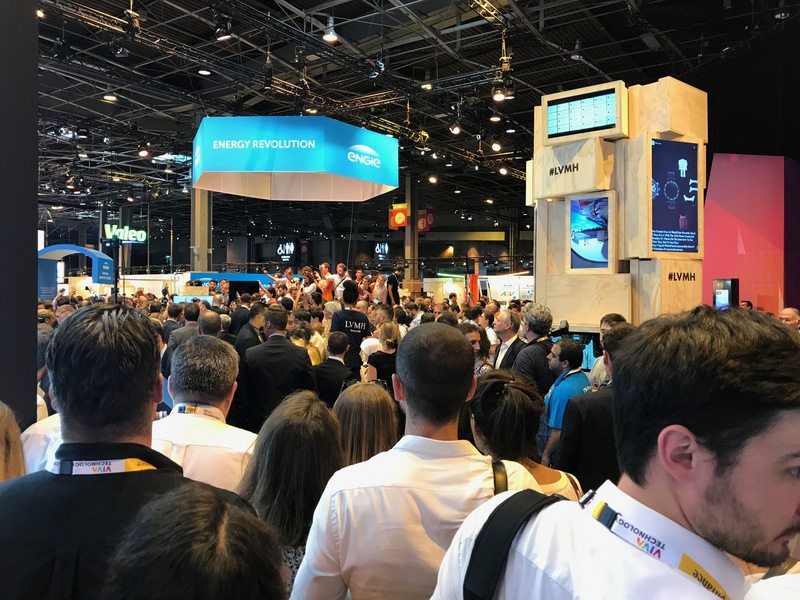 French president Emmanuel Macron spent a good chunk of his afternoon at the ginormous Viva Technology conference in Paris (or “VivaTech” for short). It wasn’t just a quick visit, Macron wanted to send a message to the startup community — he still cares about technology very much, thank you for asking. There’s a weird annual tradition in French politics. French presidents, ministers and hopeful candidates all go to the Agricultural Show in the Porte de Versailles convention center. Somehow, old ideas die hard, and it’s important to show that you still care about people in the food industry. Yesterday, Macron spent three to four hours walking down the hallways of the very same convention center, taking selfies with entrepreneurs and looking at the shiny new things in tech. It felt a lot like the Agricultural Show, except that all the cows have been replaced by robots. And then, the day culminated with a speech on the main stage. I expected a short ten-minute speech, but Macron talked for more than 30 minutes, explaining in great details what he wants to do for startups. If you’ve been following Macron’s agenda there wasn’t anything groundbreaking. He confirmed most of the things we already knew. For instance, he confirmed that founders, investors and key employees can apply to the French Tech Visa, a four-year visa for you and your family. It’s not new, but it’s one of the most pragmatic signs that France wants to be open to the world. He said that his two main challenges are tackling the digital revolution and climate change. In order to do this, he wants to support innovations in those areas. Bpifrance is going to manage a new $11.2 billion public fund to invest in startups across the board (€10 billion). It’s unclear when this fund is going to launch. Macron also reminded everyone that he wants to reduce bureaucracy as much as possible when you’re heading a company and hiring people. There will be a 30 percent flat rate on capital gain tax for successful entrepreneurs who cash out after a big exit. And people are no longer going to pay the French wealth tax if they invest in companies. More than facts, the tone of the speech was interesting. Macron said that the French government should become a startup nation where entrepreneurs are the new role models. He reminded everyone that France has some of the best engineering schools in the world and that it’s time to be proud of being French and starting a company here. According to him, the French state should act as a startup, a platform that makes it easier to become an entrepreneur, not more cumbersome than it should be. “All the entrepreneurs who are here today, I want to give you back your freedom but I also want to make you realize that it is an immense responsibility. The world that we currently live in, the world that I want to lead with you, the world in which France is a leading nation, it is a world that cannot share the same values as the world of yesterday. I want you to succeed in this world, but I don’t want you to be cynical. I want you to get rich, but you don’t get to be greedy and selfish because our societies don’t accept that anymore. It won’t happen because of a government or another. It won’t happen because of a new law on capital taxes and so on. It’s your responsibility and you have to keep that in mind. Why did British people vote for Brexit? Because for years and years, some people thought that everything could happen in the peaceful environment of the City, between quiet billionaires and politicians who were acting in their best interest. At some point, British people woke up and said no — and it was a brutal no. Why do you think that the American people chose a leader that may not be the one you would have picked? Because he knew how to talk to the middle class. The American establishment looked down on the middle class for years because they started talking exclusively with successful people. At the end of the speech, Macron spent five minutes talking in English, reiterating that he believes France is at a turning point when it comes to innovation. Overall, Macron’s speech was hopeful about the future. He outlined his roadmap when it comes to startups. More importantly, he turned his back to the startup community during the presidential campaign because he had to convince an entire country that he was the right presidential candidate. With yesterday’s speech, Macron showed that he still cares about startups and that he’s just been a bit busy lately. Now, let’s see if his government is going to implement all the changes that he promised. À #Vivatech, discours sur l'innovation et le numérique.